The silky PJs felt soft and smooth and cool against my skin as I slid into bed at Wings Hinterland Retreat on the Gold Coast. The gift-wrapped box was sitting on my pillow courtesy of Australian lingerie brand Homebodii when I retired for the night after a sumptuous banquet at the retreat. On my bedside table lay a little velvet pouch with a Fairfax & Roberts monogram. I opened it to find a delicate gold key, the significance of which became clear to me as I picked up a book, also on my bedside table, entitled THIRDHOME. I leafed through page after page of exquisite villas, chalets and resorts at breath-taking locations around the world, all members of US-based THIRDHOME, an exclusive luxury home exchange club that has just expanded to include a five-star vacation rental service and awe-inspiring travel adventures. The little key is symbolic of the privileged access enjoyed by THIRDHOME members to magnificent private residences like Leobo Private Resort in Vaalwater, South Africa; King Edward V111’s Estate in Nassau, Bahamas; Bay of Islands Luxury Retreat, in Kerikeri, New Zealand; Modern Luxury and Northern Lights in Grimsnes, Iceland; O Casarao in Armacao dos Buzios in Brazil; Alegria Mykonos, in Kalafati, Greece; Seaside Escape in Koh Samui, Thailand; The Links at St Andrews, UK . . . and Wings Hinterland Retreat on the Gold Coast. The key also opens doors to a host of residence clubs and resorts such Pristine Bay in Roatan, Honduras; Porto Montenegro in Montenegro; Chateaux Deer Valle in Utah; Trump Hotel and Tower in New York; Mar Adentro in Los Cabos, Mexico; and Argentario Golf Resort and Spa in Grosseto, Italy . . .
Then there’s places off the beaten track like a mountain refuge in Argentina; a charter yacht in Guadeloupe; and a Six Senses villa on the remote island of Con Dao, Vietnam. And access to the Ritz-Carlton Destination Club properties in Aspen, Lake Tahoe, Vail, San Francisco and Virgin Islands. I drifted off to sleep with my little key clasped in one hand and the THIRDHOME book still open in the other. In my dreams I wandered like a somnambulist from chalets in the snow to villas in the sand . . . The day had been one of lavish indulgence beginning with a Rolls Royce transfer by Queensland Luxury Car Rentals from Gold Coast Airport to Wings Hinterland Retreat, one of 10,500 properties worldwide in the THIRDHOME portfolio. 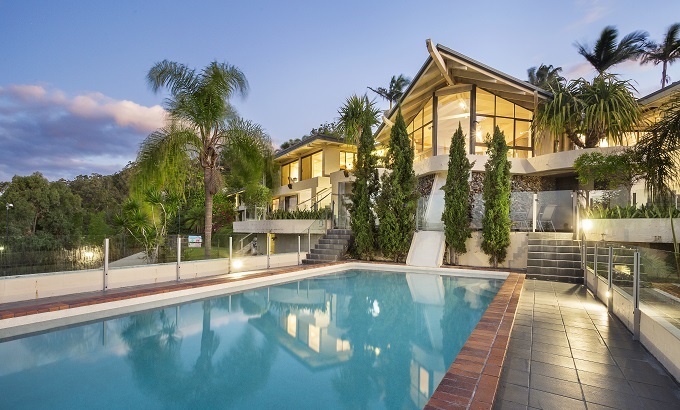 The spectacular two-storey ridgetop property, 30 minutes inland from world-famous Surfers Paradise, is set on 10 acres of land with 1500 square meters of living space. So named for the broad wings that stretch out from the centre of the house and magnificent pool, the retreat has eight bedrooms, which comfortably accommodate up to 26 guests. All rooms face towards the Gold Coast allowing early-risers to watch spectacular sunrises. Bunks in three of the bedrooms make the place ideal for families with young children or teens. The retreat is also a highly sought-after venue for weddings, conferences and corporate catering. The spacious kitchen with its huge semi-circular marble bench and adjacent dining room is perfect for both large-scale entertaining and intimate dining. 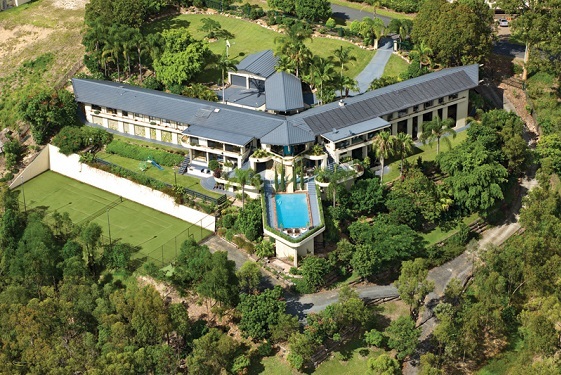 With a tennis court, cantilevered swimming pool, outside Jacuzzi, 14-person cedar sauna, full-sized billiard table and yoga on the lawn, there’s little reason to leave this peaceful, tranquil retreat but for those wanting a taste of surf, sand and shopping, the Gold Coast is an easy 30-minute drive. As the sun set on a mild winter evening, divine Louis Roederer champagne appeared from the bar accompanied by delectable canapés from the kitchen where guest chef Gareth Keenan and his catering team where hard at work. The mouth-watering menu continued with hors d’œuvres in the form of a colourful, fresh, edible garden with tasty olive tapenade ‘soil’ followed by a variety of entrees including succulent cured pork belly with macadamia nut crumble, carrots and burnt apple. The extensive main course included sumac-crusted ocean trout with boudin noir crumble, mandarin gel and young radish; grass-fed lamb rump with smoked carrot, baby vegetables, dukkah and labne; pan-fried mushroom and pumpkin with potato and chickpea fritter, spinach and red pepper coulis; or pan-seared chicken breast with boudin blanc, sauce soubise asparagus and pomme lorette. After much deliberation, I chose the ocean trout but all the options were delicious. A refreshing amuse bouche of white peach and green tea was served before Gareth presented a dessert of rhubarb, meringue and freeze-dried berries with stunning visual panache in a haze of dry ice. Even the white chocolate planter pots were edible. Gluten and lactose-free, vegan and pescatarian options were available at each course. As we feasted like royalty, talented guitarist Ondre Davis entertained us with well-known melodies. Early next morning, after yoga on the lawn led by the inspiring yogi Todd Belot, a delectable breakfast was served with choices that again catered to all dietary needs. The morning drifted blissfully by with tennis, swimming, relaxing, lounging in the Jacuzzi, steaming in the sauna and an artisan coffee-tasting experience by KoKo Coffee Roasters, while Gareth and Yves worked more wonders in the kitchen. Lunch was a series of elegant finger-food platters served cocktail-style outside by the pool and tennis court on a gloriously warm, mid-June day. The ice-cold Fire Gully rosé from Margaret River was divine and guitarist-vocalist Nick Trovas provided splendid entertainment. We were blessed with perfect weather but on the rare occasion that it rains on the Gold Coast, Wings has ample space and facilities to cater inside for large numbers in the grand entrance foyer, three generous living areas, bar and dining room. In the afternoon, we learned the full story behind THIRDHOME, a US-based company established in 2008 by Wade Shealy from Tennessee. The story behind THIRDHOME is a fascinating one. Shealy had spent 28 years in the luxury real estate business, helping clients realise their second-home dreams, when he came up with the concept of using those valuable but sometimes seldom-used assets to gain access to properties of an equal standard all around the world . . . as holiday homes or ‘third homes’. “I learned that the main reason people hesitate to buy a second home in a single location is that they love to travel to other places too,” says Shealy. “I knew if I could create a way for second home-owners to leverage the investment they’ve already made, to stay in a variety of desirable destinations, I would really have something,” he says. His aim was to use a second home as the key to a third home . . . and a world of travel opportunities. Shealy knew the service fulfilled a real need but he had no idea how successful the business would become, how many lives would be changed . . . or how fast. These trips are beyond extraordinary. The choices are mind-boggling. “THIRDHOME is unlike any other home exchange or travel club. The scale, trust and access it provides are unrivalled,” says Shealy. Today THIRDHOME’s portfolio of member homes numbers 10,400 luxury residences across the globe with an average value of $US3 million. In addition to private homes, many are located in the 75 world-class resorts and residence clubs that have selectedTHIRDHOME as a trusted exchange programme for their owners – like The Ritz-Carlton Destination Club. THIRDHOME has developed its own ‘key’ currency that allows members to manage their vacation plans, hence the golden Fairfax & Roberts key. No direct or simultaneous exchanges are required. Members earn ‘keys’ by depositing available weeks in their second homes into the THIRDHOME ‘bank’ and then go online, browse other properties within the club, choose a home and book their vacation. A service team is on hand around the clock to assist. In an exciting new development, THIRDHOME has recently added vacation rentals to the mix meaning people without a luxury second home can access the keys to exclusive properties not previously available to the public. There are now over 300 stunning THIRDHOME properties available for rent in spectacular locations in 36 countries around the world. This number is set to rise exponentially as the popularity of using private residences for holiday accommodation gains international momentum. I am assured the high standards that THIRDHOME is renowned for will be just as evident in the rental program as it has been in the home exchange service. The average value of rental properties is $3 million and each home is carefully reviewed for its desirable location and quality furnishings. Guests also undergo a comprehensive screening procedure. After a taste of ‘staying worldly’ at Wings, I drove off in the Roller, leafing through my book to find my next THIRDHOME experience. There are only 10,500 to choose from. Decisions, decisions . . .
Perhaps an adventure in Argentina?